Ernest Archdeacon was an early proponent of the automobile and aviation. Before 1900, Archdeacon had participated in several automobile races, and he founded the Aéro-Club de France in 1898. In the early 1900s, he sponsored various aviation prizes while he continued to dabble in aviation himself. Undoubtedly, his most bizarre idea was a propeller-driven motorcycle known as the aéro-motocyclette (flying motorcycle). Ernest Archdeacon (middle left) and Alessandro Anzani (middle right) pose with the propeller-driven aéro-motocyclette before Anzani heads down the straight, narrow, tree-lined road behind them. 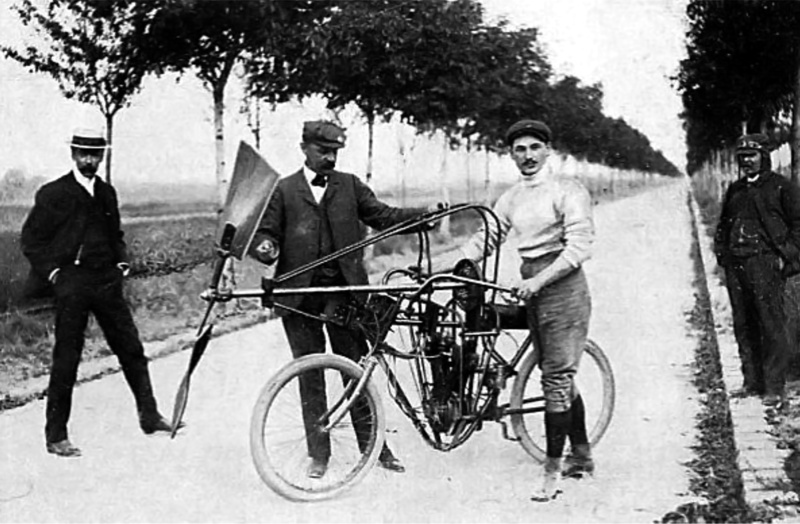 The aéro-motocyclette was built by the French motorcycle constructor Buchet. The machine consisted of a heavily modified Buchet motorcycle frame and was powered by a two-cylinder, air-cooled Buchet engine. The V-twin engine was made of an aluminum crankcase and had steel cylinders. The Buchet engine had a 2.99 in (76 mm) bore, a 3.15 in (80 mm) stroke, displaced 44 cu in (.726 L), and produced 6 hp (4.5 kW) at 1,800 rpm. The engine was mounted transversely, 90 degrees from the normal position, so that its output shaft pointed toward the rear wheel. A pulley on the output shaft was connected via a belt to a larger pulley on the propeller shaft. The size differential between the two pulleys resulted in a .5 to 1 speed reduction at the propeller shaft; when the engine was turning at 1,800 rpm, the propeller turned at 900 rpm. Most likely, a clutch mechanism was installed on the engine’s output shaft to engage and disengage the belt. The 59.1 in (1.50 m) long propeller shaft was supported above the handlebars by three ball bearings and extended beyond the front wheel of the aéro-motocyclette. At the end of the propeller shaft was a 57.1 in (1.45 m) diameter, two-blade propeller made of aluminum. To lighten the propeller, numerous small holes were drilled in the blades, which were then covered in parchment (goldbeater’s skin). The propeller’s pitch was 70.9 in (1.80 m). A case attached to the front of the head tube carried the battery ignition for the engine. Ignition controls were originally positioned on the rear support tube of the propeller shaft, but these controls were later either relocated or omitted. 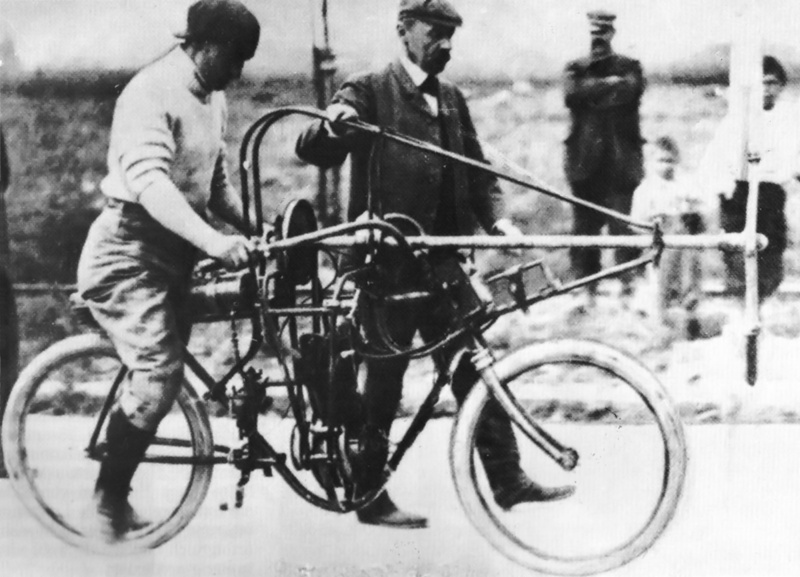 The completed aéro-motocyclette weighed 154 lb (70 kg). Detailed view of the aéro-motocyclette engine and drive system. The carburetor and fuel tank are in their original positions. The image is labeled as follows: A) propeller shaft; B) propeller shaft support frame; C) motorcycle frame; E) propeller shaft pulley connected to the engine’s output shaft by a V-belt; F) brake; G) handlebars; H) footrest; M) Buchet engine; R) fuel tank (later relocated); S) engine mount; V) starting wheel (later removed); a and b) ignition controls; and c) bag for the battery ignition. An early version of the aéro-motocyclette had a wheel installed on the end of the propeller shaft nearest the rider. The wheel was used to start the engine; however, the wheel is not present in later photographs of the machine being tested. Most likely, the starting wheel was no longer needed after the clutch mechanism was added to the engine’s output shaft. In addition, the starting wheel spinning inches away from the rider must have been a little disconcerting and probably contributed to the decision to remove it. The carburetor was initially positioned between the cylinders, and a small fuel tank was located just behind the head tube. Later, a different carburetor was installed between the engine and rear wheel, and the fuel tank was repositioned to just in front of the rider’s seat, in the space previously taken up by the starting wheel. Motorcycle racer Alessandro Anzani was selected to test the aéro-motocyclette. Anzani was born in Italy but had immigrated to France. He worked for Buchet as a motorcycle mechanic and racer, but at the time of testing the aéro-motocyclette, Anzani was in the process leaving Buchet to start his own company. In July 1909, Anzani engines would become famous after powering Louis Blériot’s Type XI aircraft in the first flight across the English Channel. Archdeacon supports the aéro-motocyclette as Anzani prepares to start off. This image clearly shows that the starting wheel has been removed from the propeller shaft. In addition, the carburetor has been installed between the engine and rear wheel, and the fuel tank has been relocated in front of the seat. There also appears to be a clutch mechanism installed on the engine’s output shaft. On 12 (some sources say 11) September 1906, Anzani, Archdeacon, and the aéro-motocyclette converged in Achères (near Paris), France. In the afternoon, Anzani fought to tame the aéro-motocyclette as it raced down a narrow, tree-lined road over a timed 1 km (.62 mi) course. At least two runs were made, the faster of which saw Anzani cover the distance in 45.4 seconds at an average speed of 49.272 mph (79.295 km/h). Anzani noted that the aéro-motocyclette accelerated smoothly and quickly to its top speed. While the concept of a propeller-driven motorcycle was insane, Archdeacon was not. The aéro-motocyclette was never intended as a marketable form of transportation. Rather, the machine was used to test the efficiency of different types of aircraft propellers. 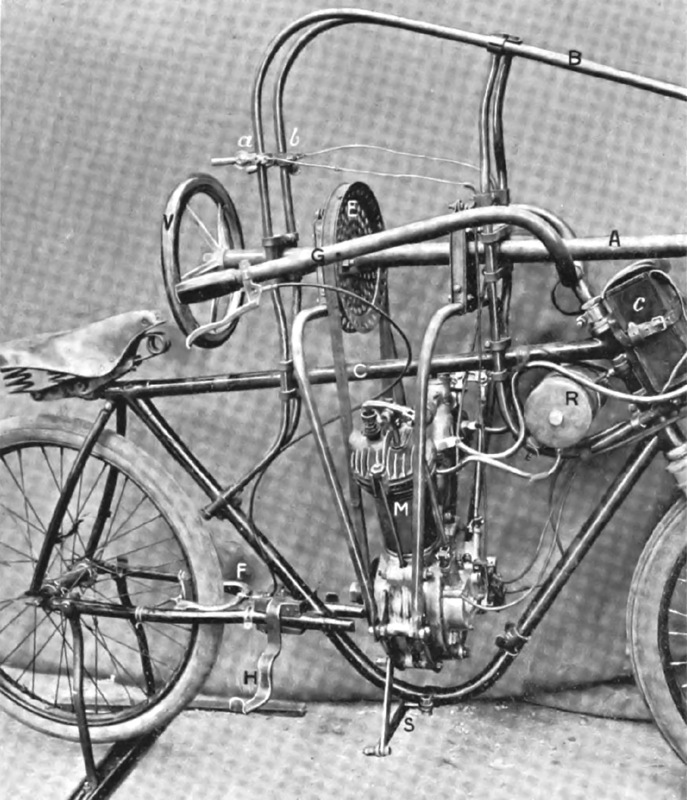 The aéro-motocyclette was built in the summer of 1906, before any powered flight had taken place in Europe. Anzani’s timed and publicized run was intended to demonstrate that a propeller could generate sufficient thrust to enable flight of a heavier-than-air craft. 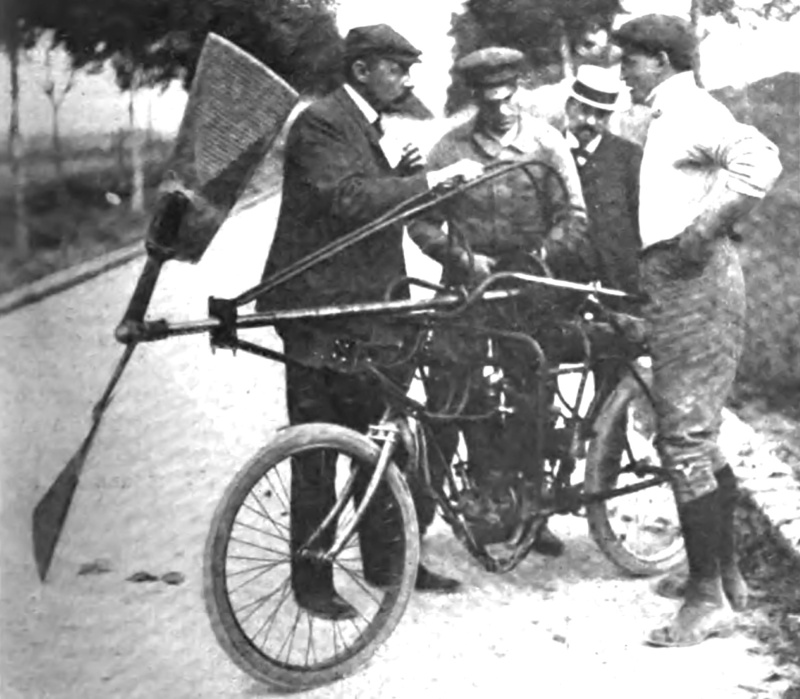 A little over a month after the aéro-motocyclette made its run at almost 50mph (80 km/h), Alberto Santos-Dumont in his Antoinette-powered 14-bis made the first powered flight of a heavier-than-air craft in Europe. Archdeacon (far left) speaking with Anzani (far right) as two others look on. The small holes in the aluminum propeller are just visible through its parchment covering. This entry was posted in Automotive on 20 August 2016 by William Pearce. The small size of the petrol tank is an obvious sign that the aero-motocyclette was only designed for very short test runs. Actually that was the normal size for a gas tank on a motorcycle back then. That’s one weird bicycle but it’s a clever idea to use as a way of testing propellers. The image with the tank mounted forward show the fuel lines leading to what may be a carb between the cylinders. Moving the carb (or fitting a different one) to the back of the engine on an extended intake manifold as seen in other photos would explain why the tank did likewise. Hello Steve – I believe you are correct. I will update the article accordingly. Thank you.